Pay homage to somebody special with a photo tucked into the Leonora locket bangle. The stunning design on the removable sterling silver locket pendant features a single glittering white topaz stone and is sure to capture hearts and attention when you wear it. 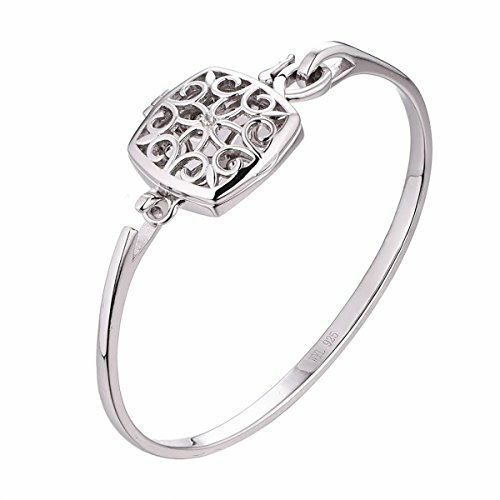 The Leonora locket bangle is named after two amazing ladies. The first, Chris' aunt Leonora, fondly known as Aunt Lee. This industrious woman raised two amazing children who went on to take the courage and strength she taught them to raise loving families of their own. When Chris learned he was going to be a father to a little girl, he couldn't think of a better name than Leonora. A resilient and strong name for a spirited little girl who loves life and makes her papa proud. Sterling Silver locket pendant and bangle with white topaz. Pendant measures 20 x 20 mm. Bangle measures 64.5 x 56.5 mm. We put your picture in it! This unique personalized custom photo square locket bangle bracelet is the perfect gift. Use your favorite picture to personalize your jewelry for any occasion. We started with photos of antique lockets as our inspiration and recreated them in a way that felt both modern and vintage. The result is a collection of lockets that capture all the fine details and workmanship of a family heirloom in contemporary shapes and sizes. With You Lockets is a line of necklaces, pendants, bracelets, anklets, rings, bangles, bouquet pins, dog tags and glass lockets all with a place to insert a special photo. Our keepsake lockets are comprised of 925 sterling silver, 14k yellow gold and 14k rose gold that hold photos. Produced with love and great care they are the perfect gift for, girls, women, mothers, sisters, celebrations, milestones, celebrations of life, memorials, bereavement, births, graduations, Mother's Day, valentine's day , Easter, Christmas, and even leveryday ike a wrinkle in time! Like the memory they honor, these pretty lockets are something to be cherished. If you have any questions about this product by With You Lockets, contact us by completing and submitting the form below. If you are looking for a specif part number, please include it with your message. JewelStop 14k Yellow Gold 3mm Engraved Baby Children Kids Bangle Bracelet - 5.5"